Adapting Stephen King doesn’t always pan out. For every SHAWSHANK REDEMPTION, STAND BY ME, and THE SHINING (though the renowned author would disagree), there’s a DREAMCATCHER or DARK TOWER that get in the way. Fortunately, filmmakers this year have aimed small and missed small. While the poorly constructed DARK TOWER, starring Matthew McConaughey and Idris Elba, misread its fortune in King’s game of success, the new set of cards dealt with last month’s IT and this month’s Netflix original films should have fans in a frenzy. Netflix premiered two films based on King’s works at Fantastic Fest this past week: 1922 and GERALD’S GAME. Both were well received at the Austin-based film festival, but audiences were most eager to play GERALD’S GAME. Stars Bruce Greenwood and Carla Gugino walk the carpet at Fantastic Fest on Sept. 24, 2017 at the Alamo Drafthouse Cinema – South Lamar in Austin, TX. Courtesy of Getty Events for Netflix. Directed by Mike Flanagan (HUSH, OUIJA: ORIGIN OF EVIL), GERALD’S GAME discovers the secret to unlocking King’s world by deepening the humanity within his narratives. In the story, Jessie (Carla Gugino) is handcuffed to a bed by her husband Gerald (Bruce Greenwood) as a way to loosen their rather wooden marriage. It’s evident early on that Jessie is hiding some traumatic baggage in her closet. As horrifying as it is when her husband croaks mid-tryst, the act forces Jessie to fight off her demons in order to free herself from the cuffs that have her bound. Much of GERALD’S GAME hinges on the secret from Jessie’s past. Not to spoil too much of the mystery of the film, we discover that Jessie has repressed memories of her father (distressingly played by E.T.’s Henry Thomas) and how he violated her innocence and ability to grow. It’s a visceral element that’s difficult to get through, but is boldly portrayed and captured. Flanagan and producer Trevor Macy, who’s worked on a few of Flanagan’s projects, described this devastating detail as the “beating heart of King’s book.” To take a moment so scary from Jessie’s past, all that vulnerability, fear and abuse, and mold it into strength is a testament to the filmmakers’ ability to capture the spirit of King’s story. They all so easily could have turned this into a standard feature about someone who tries to free themselves from a pair of handcuffs, but like Danny Boyle’s 127 HOURS, this is a story with more value. 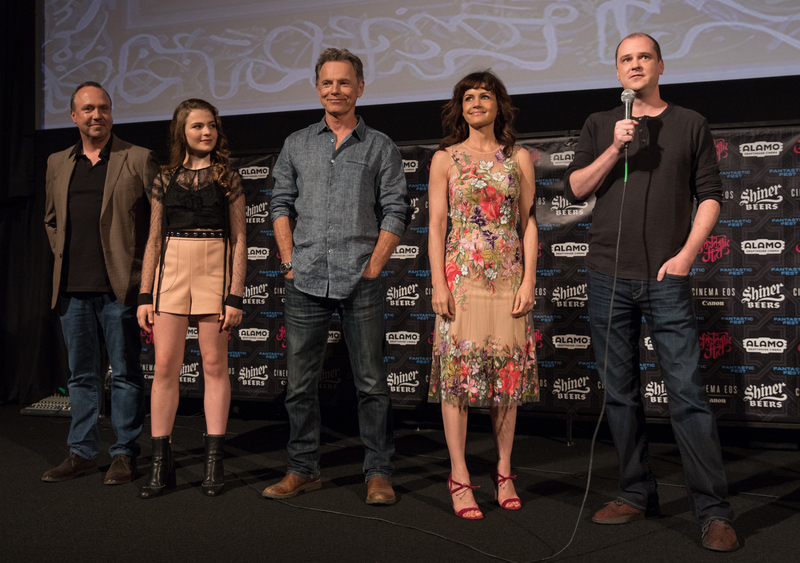 L-R: Producer Trevor Macy, star Chiara Aurelia (“Young Jessie”), Bruce Greenwood (“Gerald”), Carla Gugino (“Jessie”) and director/co-writer Mike Flanagan. Courtesy of Getty Events for Netflix. Throughout the film, we see Greenwood and Gugino also portray projections of Jessie’s cerebral landscape. Gerald awakes from his death to help and shake Jessie’s confidence, while an alternate version of Jessie appears to represent the calmer side of her character — a component that could have proven goofy in the hands of an incapable filmmaker. “I credit [Gugino and Greenwood] with a lot of the success of that. To not sell that and make that the center of the story, the whole enterprise could have collapsed,” Flanagan added. As the renewed wave of interest in King continues to attack the block, we can only hope that future filmmakers, talent and adaptations will be so congruous. Stream GERALD’S GAME on Netflix today.